To be healthy, kids need to eat a variety of colorful fruits and vegetables every day. By using a rainbow as a guide, you can ensure that children benefit from a wide range of vitamins and minerals. No single fruit or vegetable provides all the nutrients that kids need. By breaking produce down into color groups of red, orange, yellow, green and purples you can make eating fruits and vegetables fun and easy for kids! Even at a very young age, kids can easily grasp the concept of eating a rainbow. 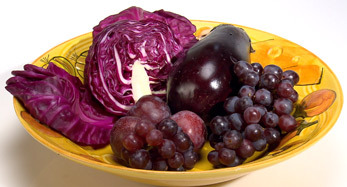 Eating colorful fruits and vegetables help protect kids from cancer and other chronic diseases. They're nutritious and delicious. The color makes all the difference. Within each color are disease fighting phytochemicals, the good guys, that fight to keep you strong and healthy. Fruits and vegetables also provide a wide range of valuable nutrients; like fiber, folate, potassium, magnesium, vitamins A and C.
So be colorful! Eat a rainbow of fruits and vegetables every day. What does blue do for you? According to the Centers for Disease Control and Prevention, eating fruits and vegetables of different colors gives your body a wide range of valuable nutrients to fight diseases and stay healthy. The different colors have different benefits and should be eaten regularly. Deep blue and purple fruits and vegetables add health-enhancing flavonoids, phytochemicals, and antioxidants that protect your cells. 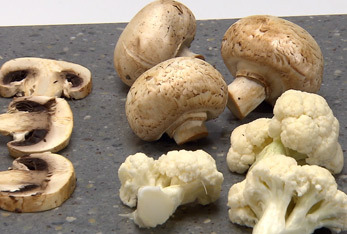 They may also help reduce the risk of cancer, stroke and heart disease. Studies have even shown that eating more blueberries is linked with better memory! Along with helping to reduce belly fat and other risk factors for cardiovascular disease and metabolic syndrome. Here are just a few ideas for blue and purple fruits and veggies that you can start eating today! What does red do for you? When you add deep reds or pinks to your daily diet, you are adding a powerful group of antioxidants like Lycopene, Ellagic Acid, Quercetin and Hesperidins. These heavy hitters are being studied for their ability to fight heart disease and some cancers. Red and pink fruits and vegetables are helpful in regulating blood pressure levels, reducing tumor growth, lowering bad cholesterol levels and reducing the risk of certain types of cancer. They're full of vitamins A and C which help to fight diseases and keep us healthy. Below is a list of some of the best red fruits and veggies you can find! What does green do for you? Green fruits and vegetables are rich in the phytochemicals that keep you healthy. For example, spinach, collards, kale and brocolli, are loaded with Lutein, which works with another chemical called Zeaxanthin to help keep your eyes healthy. These chemicals may be able to help reduce the risk of cataracts and age-related blindness. 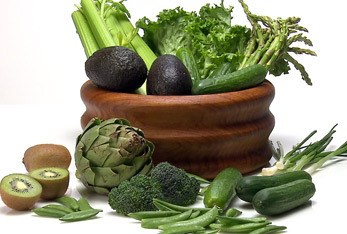 Green fruits and vegetables are also a great sources of B vitamins that help our brain. These are just a few of the hidden powers of greens! Check these superheroes out! What does orange and yellow do for you? 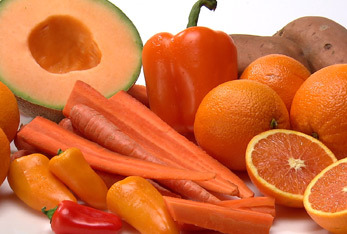 Many orange and yellow fruits and vegetables like carrots, sweet potatoes and pumpkins are rich in vitamin A. Scientists say that foods rich in vitamin A can help reduce the risk of cancer, heart disease and can even improve your immune system! Vitamin A also keeps your eyes healthy. Citrus fruits, like oranges, are an excellent source of vitamin C and B vitamins that also help boost your immune system. Whether you go for orange or yellow, you will be bouncing off the walls with a healthy heart and great immune system! 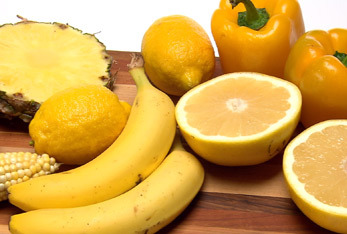 Here are some powerful fruits and veggies to start working with! What does white do for you? Eating fruits and vegetables of different colors gives your body a wide range of valuable nutrients, like fiber, folate, potassium, and vitamins A and C.
White fruits and vegetables like cauliflower, onions, potatoes and bananas are colored by pigments called "Anthoxanthins." This chemical may lower blood pressure and cholesterol and reduce your risk for heart disease, stomach cancer and stroke. Some members of the white group, such as bananas and potatoes, are good sources of the mineral potassium, too. Below are some white super heroes! Eat yours. That's right parents, you need to set a good example for your children to follow. It is amazing how many parents say they can't get their kids to eat vegetables, and it then turns out that at least one parent doesn't either eat them either. Children follow us, so lead them where you'd like them to go. The more we behave as if it's normal to eat vegetables, the more our children are likely to eat them. For that reason, eat meals with your children whenever possible. Get them involved in cooking and growing the veggies! If they feel like they have contributed by caring for the plant as it grows or by cooking it with you for dinner, they will take pride in their work. They have to eat it! Make up cool names. Anything with an awesome name is ten times better! Instead of calling it broccoli, call it POWER TREES, or MINI SPY TREES or anything else you can think of that's fun! Hide the veggies in other food. If you know they just won't make the decision on their own, puree the veggies and hide them in things like soup, pasta sauce, smoothies etc. Nothing wrong with a little dip!Putting out a platter with ranch or eve a cheese sauce to dip veggies in is always better than your kids not eating veggies at all. Make the one bite rule. Tell your kids they can't say no to a veggie before having tried it at least once for that meal. This way they might end up liking it, or, at the very least they will have had a bite or two of veggies before moving on. Make fruits and veggies accessible to your kids! Keep a shelf designated to fruits and veggies in reach of your children's arms. This way, it's the only thing they can get if they want a snack! Let your kids arrange the veggies on a plate making artwork out of them! Again, if they feel like they are contributing in a fun and creative way, they are more likely to want to eat what they took part of. Don't be the bad guy! If your kids just seem to not eat their veggies because you tell them to, don't do it anymore! Your job is to provide them with a healthy balanced meal. When you enforce eating fruits and veggies, you become the bad guy. And nobody likes the bad guy. If all else fails, Bribe them! You can always bride your kids to eat veggies with things like dessert, hangout time, a one-time pass on their chores and anything else you can think of that your child would value.